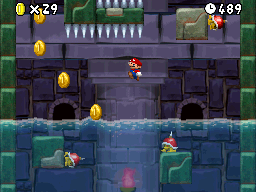 World 3 | New Super Hacker Bros.
2012 – Finished W3-1. Finished W3-2. Finished W3-3. Finished W3-B. Started W3-B. Made Several Tilesets and Backgrounds. Made a lot of new Music. Edited the Overworld textures. Retexturing Mario/Luigi for Thunder-Flower. Some other things. 29.03.2013 – Rebuilt W4-3. Fixed W3-3. Started and finished W3-Tower. 30.03.2013 – Finished W3-A. Worked on 3-C.
01.04.2013 – Started and finished 3-Castle. Started 3-GH.